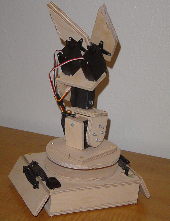 When I first started in the field of robotics, electronics and sensors I had always wanted to make my own robotic arm. The idea of being able to make such an advanced idea come to life out of simple parts found around the house was mind boggling to me. So inspite of that, I set out to prove to myself it was possible. I went through several initial designs before I set my heart on the one that you see here. I feel this one is the simplest that I came up with and therefore the easiest to build. I still can't get over the It's made out of friggin' wood! factor of this design. 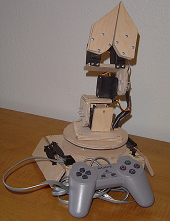 The goal of this project is to create a robotic arm that can move in most any direction like a humanoid arm. It should have grippers on the end that can grip trivial objects like a piece of paper or a pen/pencil. A simple design with as few moving parts as possible is important for this design because the arm will only be controlled by a PIC 18F452. This potentially limits the ability to control the arm with smooth movements.